Hey Towboaters! Look who I saw in Ice Harbor, Dubuque, IA. on the 4th of July! I guess if you have to work on Independence Day, it ought to be OK to take a little break along the River, right? I took a few other pictures in Dubuque, one of my favorite little Towboats. Hope everybody is doing well, and staying safe. All for now, talk to ya later! Stopped by Riverside Park at the Muscatine IA. harbor. After we left the Marina, we crossed the river into Illinois and visited the Lock and Dam right North of Muscatine. Hey Guys! A Friend of mine & the Chief of Police bought this dredge. Interesting partners if you know my friend. Hope to get some good pictures of them dredging the marina! Hey You Two! Went down to Bluff Harbor Marina to see Mark & Dave's dredge in the water! Can't wait to see it pump! Hey Guys. I'm sending you both some pictures we took this morning. Just want you to see our river. The Bette-Lynn was shoving a crane barge upbound @ RM 407. Picture from the channel of Bluff Harbor Marina. Coral Dawn, downbound passing Burlington. The Joseph Patrick Eckstein was traveling upbound under the Hwy 34 car bridge @ RM 403.2. Notice the supply boat tied along side! Mississippi Queen tied to the seawall. Well, Hello, my Fellow River Rats! I hear you have been receiving some e-mail from Miss Izona! I hear she was telling you something about getting her bottom wet? I walked down onto the docks in Burlington this morning, and look who I saw! By the way, that's the Mississippi Queen in the background tied alongside the Port Of Burlington Building. Hello Fellow Towboaters! I passed thru Halltown Mo. last week on my way to Joplin, and look at what I saw. Maybe a "Sister Ship" to the Little Toot? Nobody around, so we'll have to wait for details. Hello Dave! I made a CD with almost all of my boat pictures and went to the post office to mail it, when what do you think I saw tied to the sea wall in Burlington? 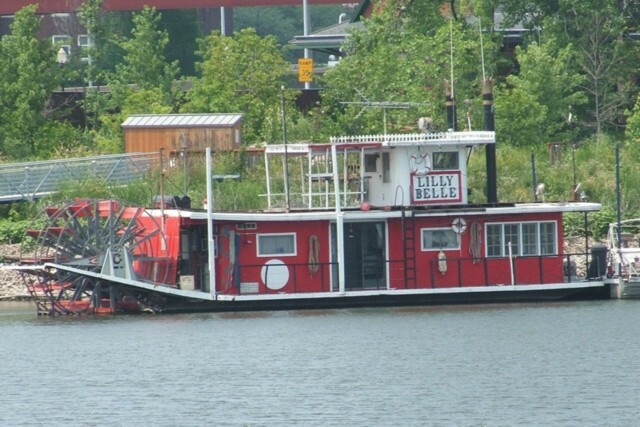 The towboat "River Cleanup".